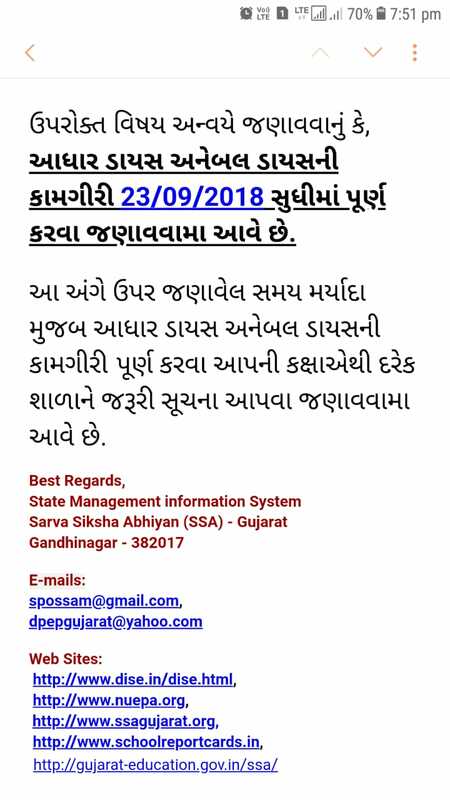 Aadhar DISE date extended to 23 Sep 2018.. Welcome To Aadhaar Enabled DISE Gujarat State implemented Aadhaar Enabled DISE - Child Tracking System for collection of Student-wise information for Elementary Schooling of Class I - VIII since January 2012. Welcome To Aadhaar Enabled DISE.Aadhaar Enabled DISE is deployed with a concept adopted from UIDAI to build database of students along with child wise record with Student Name, Parents Name, Date of Birth, Address, incentives & benefits received from Government. Welcome To Aadhaar Enabled DISE .he same database is being used by State to conduct child wise evaluation under Gunotsav programme. Each year, existing records are being updated and new entrants in Class I are being entered under the system.